During the first week of May, the John Molson School of Business (JMSB) hosted the inaugural Van Berkom-JMSB Case Competition in Montreal. This competition was open to graduate business students and had a focus on small-cap portfolio management and value investing. The format and focus were inspired by the investment philosophy and strategy of Van Berkom and Associates Inc. Participants were expected to propose investment strategies that reflect the rigorous research, analysis, risk management, and selection processes that allow small-cap firms to maintain long-term growth. Qualifying teams competed for a generous prize pool of $10,000, which was paid out to the top three teams. This year our team was led by MBA student Javier Glatt, with three MSc. ?Finance students: Stephanie Shi, Steven Sivorot, and me (Ben Huang). This?was the first John Molson School of Business (JMSB) Van Berkom case competition, so we thought it would be a great way to test the waters. 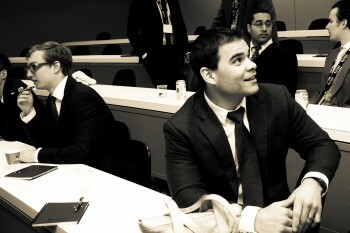 Because Javier was already in Montreal for a trip with some MBAs and EMBAs, Stephanie, Steven, and I met him there. By the time we?arrived at the hotel, it was already 1:30 AM. That did not stop us from?trying some of Montreal’s midnight snacks, though! Steven had some pizzas?from around the corner and I had some Timmy’s with a donut that I’ve never seen?in BC before. Then it was bedtime; the next day was going to be a long one! Because we were all jetlagged, we decided to sleep in. It was a great time for brunch by the time we got up. We went to a breakfast?chain “Cora’s” and it did not disappoint. On our way back, we walked by a?stunning coffee shop called “Olivier Potier Artisan En Gourmandise” that later became our favorite place in Montreal. ?The pastries and espresso at this beautifully designed coffee?shop just blew us away. I strongly recommend this place. After breakfast, the?team sat down to finalize our overall strategy and review our models to get?ready for the competition. Registration for the competition started at 7:00 PM. With us were teams from?Ontario and Quebec. Everyone looked confident and professional, and couldn’t wait?for the competition the next day. After being greeted by the organizer, there was a?small reception with wine and cheese. We decided to head back to the hotel?early to do a final push of preparation. After reviewing my valuation?models a few times, the team decided to go to bed early for?the 7:00 AM event the next day. We got ready around 6:00 AM and made our way to?the event with excitement. After?breakfast, the teams were introduced to the?target company and were given information about the company and its philosophy of how Van Berkom and Associates chooses?its investment (poor Steven had memorized all this information the day before). Due to the way the event was organized, we had to sit aside and were not allowed to talk about the company for 1.5 hours before we could start?our case preparation. Those were probably the longest 1.5 hours I’d ever gone through in my entire life. Hopefully they will change this in future?competitions. Finally, it was our turn to start. Three hours was all we had to make a?strong statement to prove that we could compete with the big schools from the East. With chills going down our spines, we read the?annual reports, press releases, and other related information given. 30?minutes went by fast. We quickly discussed what we found, painted a?general picture, and went to work on our presentation. Javier worked on the business models and strategies,?Stephanie on the financial analysis, and I on the stock evaluation. Steven?assisted everyone on each part of the presentation. 30 minutes left… Time was against us. We all tried our best to put the?presentation together into one file. 10 minutes?left… Wait! We hadn’t practiced yet?! Then someone walked into our room and?announced that our time was up. We did not get to practice the entire thing but, in all?honesty, it did not affect my confidence because I knew we were all great presenters. We did not have more time to think about the case or the presentation. We?made our way to the presentation room, shook the judges’ hands, and started our presentation. As I had expected, the presentation went smoothly. It flowed well and?the judges seemed impressed. After our 20-minute presentation was a?10-minute Q&A session, which I thought we did relatively well in. There is always?room for improvement, but from?my experience with case competitions, I knew we did great. Not surprisingly, we all came out of the room with confident smiles. Each of us was surprised by how well it went, and we were proud of what?we were able to accomplish in just three hours. There was an hour break before they announced the finalists. We were so confident that we were going to?make it to the next round that we started to prepare for our next presentation. That hour felt very long as well. The judges later had a private discussion with us and explained the?reasons why we were not chosen for the final. It was a tough pill to swallow, but I took the comments rather well. Since we did not make it to the finals, we had the opportunity to sit in and watch the first finalist’s presentation. However, we soon found that it was tough because we felt that we could have done better. One of my?teammates decided to not watch the two other presentations, but I?decided to stay because I believed the final two would be better. I was not disappointed. The final two teams were neck-and-neck and it was hard to determine who the winner would be. Both teams had flaws in their valuation?models, but mistakes were expected given the timeframe. After the competition were the reception dinner and networking session. Both went really well. I stayed behind for networking while my team went back to the hotel. By the time I got back, everyone was already in bed. Sadly, it was time to pack up. After sleeping in for a bit, we had a?short breakfast and were off to the airport. We did not get a chance to?tour the city very much due to the scheduling of our flights and the various events. It turned out that our flight was delayed for almost two hours. We wished we had known earlier so that we could have at?least toured Montreal for two hours! The overall experience?was wonderful, though. The competition really brought our ability to handle?time constraints to another level, and we all gained some knowledge on how professionals treat small-cap stocks. We would like to thank all the cohorts and the instructor who supported us and trained us. ?Hopefully next year’s team will bring it to the next level for our?university.